Sales record number: The number assigned to the transaction by Selling Manager for identification purposes. User ID: The eBay user ID of the person who purchased the item from you. Buyer zip: The buyer’s ZIP code. State: The state the buyer resides in. Buyer country: The country your buyer lives in. Item number: The eBay number assigned to the item when you listed it for sale on the site. Item title: The title of the listing as it appeared on eBay. Quantity: The number of items purchased in the transaction. Sale price: The final selling price of the item. Shipping amount: The amount you charged for shipping the item. Shipping insurance: If the buyer paid insurance, it’s listed next to his or her sales record. State sales tax: If you’ve set up Selling Manager to calculate sales tax for your in-state sales, and sales tax was applied to the item when it was sold, that amount is listed here. Total price: The GSA (gross sales amount) for the transaction. Payment method: The method of payment used by the buyer. This is inserted automatically if the item is paid through PayPal, or manually inserted by you into the sales record if paid by another method. Sale date: The date the transaction occurred on eBay. Checkout: The date of checkout. This is usually the same as the transaction date. Paid on date: The date the buyer paid for the item. Shipped on date: The ship date you entered in Selling Manager. Feedback left: Whether you left feedback for the buyer is indicated by a Yes or No in this column. Feedback received: The feedback rating left for you by the buyer (positive, negative, or neutral). Notes to yourself: If you input any personal notes regarding the transaction in the sales record, they appear here. Keep in mind that Selling Manager reports are available on the site for only four months, so be sure to download your information regularly. Notice that there is no column reflecting the eBay fees you paid for listing and selling the item. If you have plenty of time on your hands, you can create another column and input the fees from your eBay invoice for each item. Save time by posting the monthly total once a month in your bookkeeping program. The opening page of Selling Manager is your my eBay Summary page. Under Seller Tools, click the File Management Center link. This takes you to the File Management Center. 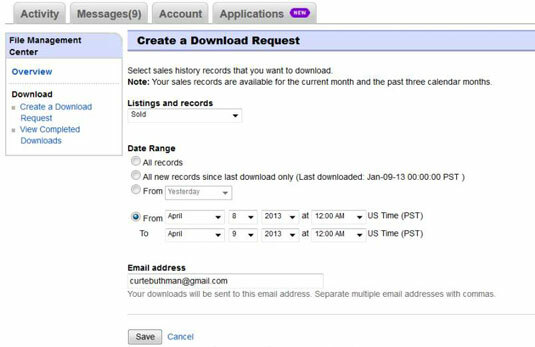 Click the Create a Download Request link. A Create a Download Request page appears. Select the listings and records you want from the drop-down menu. Your e-mail address is already filled in, but you may add another if you want duplicate notifications. Select the time period you want to include in your report. It’s best to generate monthly or quarterly reports, so that your reports coincide with specific tax periods. You can always combine more than one report in your spreadsheet program to show different periods of time. You then see a confirmation page and a confirmation number for your request. eBay will send you an e-mail when your report is ready. You will receive an e-mail (almost immediately). Click the link in the e-mail, and you’re taken to the View Completed Downloads page. 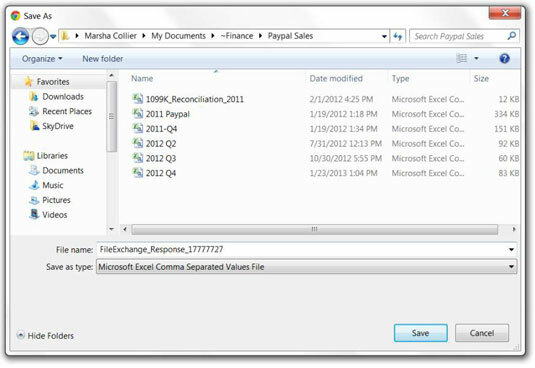 Rename the file to reflect the sales month and year, and then click Save. After the file is downloaded, you’ll see a confirmation with your new filename. It’s a good idea to create a directory on your computer with a name such as eBay Sales. In this directory, you can store all the reports you download from eBay, PayPal, or any other online service. Be sure to include this directory when you perform regular data backups. 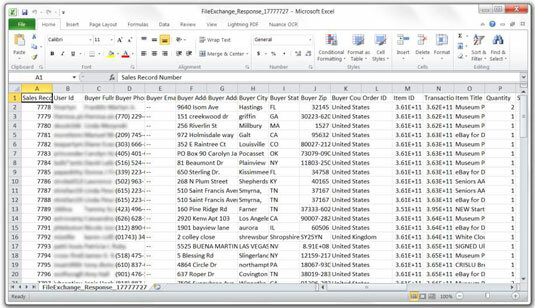 Now you can open the new file in Microsoft Excel. Highlight the column by clicking the column letter. Voilà! The offending column is no more. All spreadsheet tasks mentioned here can be performed in similar fashion in Google Docs. Click in the blank cell at the bottom of the column you want to total. Click and drag over the cells you want to sum. Click the AutoSum (”) button (also found under Formulas tab). If you want to total the columns next to the one you just totaled, you don’t have to re-input the formula. Just highlight the results cell from your last formula, and highlight cells in the same row that you want to contain totals of the columns. Then under Editing, click below the Σ symbol to fill cells right. This copies the formula and all the columns are totaled.